I’ve reviewed the Godox XPro trigger before, a little over a year ago. Normally, I wouldn’t review the same product again just because it comes out with compatibility for a different camera system. My original review was with the XPro-C, but I didn’t review the XPro-N, XPro-F, XPro-S or XPro-O. So why am I posting a review of the XPro-P for Pentax? Well, to put it simply, it’s kind of a big deal – at least for Pentax shooters. Pentax has traditionally had very little 3rd party flash support. It’s had some from Cactus with the whole X-TTL thing, but the recent demise of the RQ250 has left Pentax shooters with very little confidence in Cactus’ future. Other options have been iffy at best. But now there’s a new kid in town. The Godox XPro-P. Note: You’ll see notes like this throughout the review as I’ve received updates from Godox while writing. Some of my experiences are likely to improve over the next few weeks as new firmware updates are released. I’m going to get this out of the way right at the start. If you’ve been stacking a Godox X1T-C on top of your Cactus V6II in order to get at least some measure of ability with the AD200 or other Godox lights, just go and pre-order the Godox XPro-P trigger now. Don’t debate, just do it. Trust me. Now let’s talk about how I came to this conclusion. The most difficult part about writing this review was finding somebody local that actually shoots Pentax so that we could give it a good workout. I didn’t want to just borrow a Pentax and give you my own thoughts. I wanted to find an actual Pentax shooter that understands the struggles of working with flash on Pentax and get their thoughts on it, too. Paul… You remember Paul. He put me in touch with Lex, who shoots a Pentax K1. Then the three of us went out to spend the day shooting portraits of strangers on the street in Glasgow. After “Holy crap, a Godox XPro trigger for Pentax!” my first thoughts were that it feels much like the other XPro triggers. I’ve got the XPro-N, XPro-C and XPro-S, and they all feel good and solid. But I wanted to see how up-to-date the firmware was. The existing XPro triggers recently received a firmware update, so I wanted to see if the XPro-P was missing anything. Note: The XPro-P I received is the final hardware, although I believe with a pre-production firmware (version 0.3), so these things are likely to be fixed in a future firmware update if they haven’t been sorted by the time it ships. Note: Godox has told me that 0.1 step adjustments will be coming in a firmware update mid-November. Lex, however, spotted another one as soon as he put it on his camera. I didn’t actually realise that Pentax required rear curtain sync to be set on the flash/trigger. That’s similar to how Canon works. I assumed it would be set in the body like Nikon and most other systems. Regardless, the ability is missing at the moment. Other than that, all of the features I’ve come to know and love in my other XPro triggers seem to be there in the XPro-P, too. Although there was one slight discrepancy on the TCM (TTL to Manual) settings. In all of my other XPro triggers, which have been updated to the latest firmware, the TCM settings offer speedlights, 200j, 360j and 600j. On the XPro-P, however, the 360j option has been replaced by a 400j option. This suggests one of three things. Either Godox just forgot to include the AD360II in the XPro-P (and the AD400 Pro in the new firmware for other XPro triggers), the setting applies to both the AD360II and AD400Pro as they’re so close in power, or Godox is planning to completely drop support for the AD360II strobe. Which of these scenarios is true, I’m not entirely sure, but it was a curious observation. When and if I find out which one it is, I’ll be sure to update this review, although I suspect it’ll be the latter of those options. It would be a shame to see the AD360II disappear. I really like the AD360II. But the dual AD200 kit with the AD-B2 head, as well as the possibility of an extension head for the AD400 Pro makes the AD360II slightly redundant. Upon arriving in Glasgow, we headed to the roof of the car park we were in to see exactly which of the Godox lights I had brought were compatible with the XPro-P. Some of you might be a little disappointed here but bear in mind that Godox will likely update the firmware for some of these units in the coming weeks. We tested the Godox TT600 speedlight, the AD200, AD360II, AD400 Pro and AD600 Pro. The latest round of firmware updates was specifically to add Pentax capability to the AD600 Pro, so we were pretty confident that was going to work flawlessly (and it did). We didn’t know until we tested whether the AD400 Pro would also include Pentax support, but it turns out that it does. Originally we’d hoped that the AD200 would just magically support it, as it’s a nice lightweight strobe to cart around the streets of Glasgow all day. But we were perhaps a little optimistic. Update: The Godox XPro-P now has full HSS & TTL capability with every Godox speedlight & strobe except for the AD360II. Download firmware updates for your lights here. I was actually quite surprised that we even managed HSS with the AD200, given that it’s not had a firmware update since the end of 2017. Interestingly, the latest AD360II firmware was released only a couple of weeks before the AD200 firmware, but that doesn’t seem to support it. Note: Godox has told me that TTL support on the AD200 should be coming in a firmware update around the middle of November. They have also said that an update will be coming for the AD360II, but they have’t said when yet. But we wanted to test the TTL capabilities and reliability of the XPro-P as well as HSS, and we didn’t want to have to keep swapping strobes out all day. So we ended up taking the AD400 Pro with us on the day’s adventure. I covered some of our initial tests in the AD400 Pro review, but we weren’t only using the XPro-P that day. I had my Nikon D800 with the XPro-N and Paul had his Sony A7II with the XPro-S. So, we went to a small park to do some testing and to figure out what combinations of settings would work well for all three of us. The XPro-N for Nikon has been out for almost a year now. I received a preproduction unit shortly before that was released, too, and it’s been absolutely rock solid ever since. The XPro-S has also been out since early 2018 and it, too, has proven to be extremely reliable. Given the differences I spotted in the firmware, we wanted to ensure that the XPro-P would trigger as reliably as its Nikon and Sony counterparts. Lex has thus far been using a combination of stacked triggers to fire his Godox AD200 from his Pentax K1. Essentially, the Cactus V6II sits in the K1’s hotshoe and then a Godox X1T-C sits on top of the V6II. The V6II basically acts as a go-between, converting Pentax language to Canon language and back again. But Lex says that HSS is somewhat unreliable, and if he wants to shoot TTL then he’s got no chance above the sync speed. And even when below the sync speed, it’s pretty inconsistent and reliable. Our tests in the park showed that neither the K1, XPro-P or AD400 Pro had any problem either below sync speed, in high speed sync mode or when using TTL flash. It just worked. And it worked as well as I’ve experienced with Nikon, Canon and Sony. I was pleased, but Lex was starting to get very excited. While many of us take 3rd party flash support for granted, it was like a whole new world had opened up for Lex. We kept the AD400 Pro powered up all day so that we didn’t have to worry about it not going off because we’d forgotten to turn it back on in between talking to people. The XPro-P and AD400 Pro kept up communication all day, with plenty of battery power left in both when we were done. We kept the AD400 Pro inside a Pixapro 65cm 16-sided easy-open umbrella softbox (similar to the 25″ Glow EZ Lock collapsible beauty dish). I like small softboxes for this kind of work. They’re light, easily portable, but still large enough to offer some softness when used fairly close. Pentax K1 and SMC A 35-70mm f4. 1/1000, f/4, ISO200. AD400Pro in TTL mode. While we bounced through all three cameras during the day, the only images I’ll be posting here are those shot with Pentax. We really wanted to try and push the strobe to see how it handled high speed sync and TTL. As I mentioned, Lex’s stacked trigger setup wasn’t very reliable. So, having some measure of consistency, especially with TTL, was a big deal. While the light changed throughout the day on our subjects the TTL capabilities of the K1, XPro-P and AD400 Pro combo worked beautifully. It didn’t matter whether our subject was in complete shade or strongly backlit by the sun. We also wanted to see how it handled slightly trickier, wider scenes with the flash at a distance. So, when we came across a painter creating his works on the street surrounded by a crowd of people we thought this would be the ideal opportunity. Paul held the light up over a crowd about 6 people deep, and a good 10-12ft away from the subject. Lex focused on the artist and fired. Pentax K1 and SMC A 35-70mm f4. 1/320, f/4, ISO200. AD400Pro in TTL mode. The TTL flash exposure worked very well to balance out the subject in the relatively dark shadow of the surrounding onlookers to the brighter environment behind them. And it carried on performing well throughout the day, with very consistent results. We even stumbled across of other photographers that day. They didn’t seem to mind being on the other side of the camera for a change. The gentleman above never did make the switch to digital, and still shoots weddings and events with his Leica film gear. He did tell us he’s been having a good look at Fuji recently, though. As the sun started to come down, we began to wrap up our tests but met somebody else out with their camera. Street photography is such a fun topic, and there are plenty of people out there on the streets of Glasgow doing it whenever I visit. The only thing you have to be careful of when photographing other photographers, though, is that they might want to photograph you back, as Lex discovered. No flash on this one. We hadn’t brought the XPro-C with us for him to try! Overall, the XPro-P did very well. For Paul and myself, it was business as usual. We’ve been using Godox triggers and lights for a while with Nikon, Sony and Canon cameras. So we’re used to this kind of capability and consistency. But for Lex, it was like a whole new world had just opened up to him. As he mentions in the video, with the XPro-P trigger, he now feels confident using wireless flash for paying gigs where he couldn’t trust his stacked trigger combo in the past, preferring to use a TTL cable. Off camera, he later told me that this was literally a game changer for Pentax photographers. It opens up so many more opportunities that just haven’t been worth pursuing before because flash on Pentax was just too unreliable. Proof that I’ve now used a Pentax camera. Thank you, Lex!Pentax K1 and SMC A 35-70mm f4. 1/1000, f/4, ISO200. AD400Pro in TTL mode. The Godox XPro-P trigger is available to buy now for $69 (B&H), and I’ve received reports that the first pre-ordered triggers have already started to arrive. So, if you order one now you probably won’t be in for too long of a wait. Many thanks to Lex for letting us use his Pentax K1 to test out the new trigger, and to Paul for being our Strobe Slave for the day. Be sure to check them both out on Instagram. Is the Godox trigger compatible with other brands of flash? Noting that the Cactus V6ii can control other brands of flash then their own, and does HSS on Pentax. Yes, you’d need the X1R receiver for each of your speedlights. That’s actually a ‘No’ then, as what’s the point of it not being able to talk directly to the receiver already present in the flash. The Cactus is pretty clear on their website, that it can directly communicate with other brands flashes, such as being able to control the Nikon, Canon, Yong Nuo etc flashes while connected to a completely different camera. you still need a cactus trigger for each brand of flash you want to control. Most people will stick to a single brand of flash, rather then mix and match. Ooohhh now i can start looking at collecting pentax gear 😀 YAY! Those three pentax photographers will be so happy .. The ACON triggers have been around for Pentax PTTL and HSS flash for a few years but for some reason ignored – I have been using mine for nearly three years. Thanks for the review. I shoot with a Pentax K-3 and a K-1, so I am thrilled about having a trigger dedicated to Pentax for my Godox and Neewer studio strobes. The Cactus system on its own is very reliable. Any problems experienced are surely due to the trigger stacking approach which isn’t officially supported by Cactus. 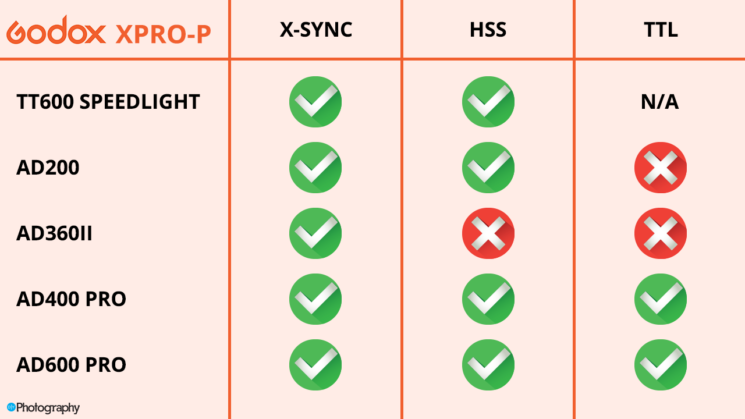 The Cactus V6II has been offering HSS and cross-brand compatibility for a long time now and even TTL has been available (through a free firmware update), so the notion of a “game changer” put forward by the article is an exaggeration, in my view. The only, but rather significant, “game change” is that the Godox XPro-P opens up access to Godox’s large range of lighting products, in particular the AD400PRO and AD600PRO. Given that the RQ250 won’t be produced, the Godox/Flashpoint alternatives are highly welcome. Personally, I’ll be waiting for the Mark II version from Flashpoint as it will provide better ergonomics than the XPro. Yes, that was kind of the point of Lex’s statement. The only things “officially supported by Cactus” are their speedlights and dumb slave strobes via sync socket. So, the Cactus system on its own isn’t really that great – especially now the RQ250 has been scrapped. Being able to remotely control everything from the hotshoe and not have to physically walk over to every light to keep adjusting and testing (as well as getting HSS and TTL with everything) is definitely a huge boost in workflow speed. Anything that speeds up the workflow and reliability on a shoot is something that most paid photographers welcome. Cactus already supported controlling everything remotely from the hotshoe. Even AF-asssist functionality on the receivers which can be handy for focusing in dark conditions and large camera to subject distances when a camera-based AF-assist light will fail. I’d say the Cactus system on its own is great. It is just, unfortunately, very limited in terms of lighting choices. The RF60X is a very capable speedlight with very fast recycling and a nice feature set, plus a large range of third-party speedlights are supported, however, the options are all power-limited speedlights. If the RQ250 had gone forward, Cactus would have provided a very viable and attractive alternative to Godox, in particular if they had subsequently added further, more powerful strobes. As it is, Cactus will probably struggle to compete against Godox, as pricing and versatility are in favour of Godox; with most shooters not needing or recognizing some of the advantages of the Cactus system. If Cactus works for you, then stick with it. Doesn’t bother me one bit. But a lot of people want more power than a speedlight can offer, especially outdoors, on location, in bright light with big modifiers. You wrote you used a SMC-M 35-70/4 on the K1. That could not be. I thing you used a SMC-A 35-70/4. The M-Version of this glas does not exist and with M Lenses there is no chance to use TTL. For this you need at least the electric contacts of an A-Series Lens. M-Series lenses have absolutly no contacts to communicate with the cam. So maybe you schould correct the lines under the pictures. Good work by the way! Has the AD200 been updated yet? If not is it a sure thing that it will? I’d like to purchase both.